In less than four days, two Brazilian journalists received death threats through social networks after publishing reports critical of the country's past and present Armed Forces. 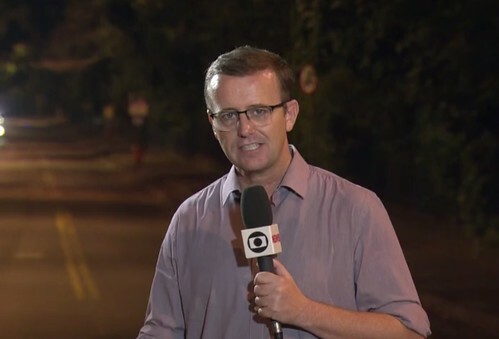 TV Globo reporter Carlos de Lannoy was responsible for a report about two recent deaths at roadblocks carried out by the Brazilian Army in Rio de Janeiro that aired on the night of April 7 on the program Fantástico. The report focused on the death of a 51-year-old musician and security guard who was hit by one of more than 80 gunshots fired by the military against the car he was in with his family on Sunday afternoon. A few hours after the report aired, Lannoy posted on his Twitter profile a threat left as a comment on a post on his Instagram profile. "You messed with the army, you signed your sentence! Your family will pay!" the user @erikprocopio wrote. TV Globo reporter Carlos de Lannoy received a death threat after his report aired on Sunday (Apr. 07). (Screenshot). "You will answer for this threat," the journalist replied. "What you have done is not just a shameful, unfortunate and regrettable statement, but a crime under law. Wait and see!" Lannoy added. Following the journalist’s post of the threat, media outlets like Jornol do Brasil and the site Metrópoles reported that the person who threatened Lannoy is Erik Procópio, who holds a law degree and was a candidate for councilman in 2012 in the municipality of Nísia Floresta, in the state of Rio Grande do Norte, in northeastern Brazil. The user @erikprocopio left another comment apologizing to the journalist and saying that he deleted his comment with the threat, which he considered "completely unmeasured and unreasonable." "@Carlosdelannoy is a great professional and my respect and apology remain!" @erikprocopio wrote. In addition to Lannoy, reporter Juliana Dal Piva of Época magazine and the newspaper O Globo also received a death threat through social networks. As reported by the Brazilian Association of Investigative Journalism (Abraji), on April 4 Dal Piva received the message "You will die" from a profile that used a pseudonym. Abraji did not specify the social network through which the journalist was threatened, but reported that the threat was motivated by an article by Dal Piva for the newspaper O Globo about a documentary with a perspective favorable to the military dictatorship, which was imposed by the country's Armed Forces with a coup d'état in 1964. In a statement, Abraji expressed solidarity with Lannoy and Dal Piva and stated that "threats against journalists because of their professional activity are unacceptable." "The widespread environment of aggression against journalism –embodied in violence against communicators – is detrimental to democracy and can not be tolerated," the organization said. Abraji also recommended that, in cases such as these, journalists denounce "threats and other violations to the platforms in which they take place" – the social networks through which aggressions are made – and trigger judicial authorities, such as the police and the public prosecution. According to the organization, Lannoy and Dal Piva denounced the threats to the platforms and reported them to the authorities. The Brazilian Press Association (ABI) also issued a statement on the Lannoy case. The organization said it "repels with indignation" the threats against the journalist. "Any intimidation of a journalist is a serious offense against the constituted order and democracy itself. Police have a duty to act quickly to identify the person responsible for the threats to the journalist Carlos de Lannoy," the ABI said. Maria Jose Braga, president of the National Federation of Journalists (Fenaj), told the Knight Center that "threats through social media should be considered as threats." "They must be denounced and companies must support their professionals so that these complaints do not fall into the void, so that those responsible are identified and punished. Just because a threat is made through social media doesn’t mean it can be trivialized. A death threat is a crime, it has to be investigated and the person responsible has to be identified and punished," Braga said. The Knight Center contacted Juliana Dal Piva, who declined to comment, as well as Carlos de Lannoy, who did not respond as of publication of this article. The Knight Center also attempted to contact Erik Procópio, named by some media as the author of the threats against Lannoy, by telephone, but was unsuccessful. It also tried to contact the user @erikprocopio on Instagram, but the page is unavailable.